杨诗杰, 刘辉, 李奔福, 字金荣, 彭佳, 王东, 盖瑶, 张雄英, 巴建峰, 刘启胜, 薛靖波, 肖宁. 四川省石渠县2016年小兽感染棘球蚴情况调查分析[J]. 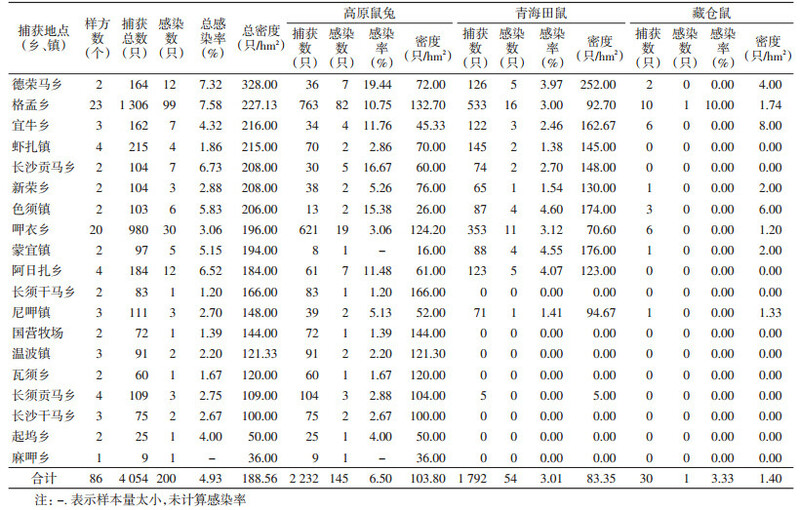 中国媒介生物学及控制杂志, 2018, 29(3): 235-238, 249. YANG Shi-jie, LIU Hui, LI Ben-fu, ZI Jin-rong, PENG Jia, WANG Dong, GE Yao, ZHANG Xiong-ying, BA Jian-feng, LIU Qi-sheng, XUE Jing-bo, XIAO Ning. Epidemiological investigation on echinococcosis infection in small mammals in Shiqu county of Sichuan province, China in 2016[J]. Chin J Vector Biol & Control, 2018, 29(3): 235-238, 249. Corresponding author: XIAO Ning, Email: ningxiao116@126.com. Abstract: Objective To investigate the prevalence of echinococcosis in wild small mammals and to provide baseline data for its effective control and prevention. Methods The tools of clip traps or rope loops were used for trapping the small mammals at Shiqu county, Sichuan province, and then the captured animals were dissected to inspect the infections. SPSS 17.0 and ArcGIS10.1 softwares were applied to analyze the data and address the spatial distribution analysis. Results A total of 4 054 small mammals were collected with an average captured rate of 10.21% (4 054/39 720). The average density of small mammals was 188.56/hm2, and the average prevalence of echinococcosis was 4.93% (200/4 054). There were 2 232 plateau pika (Ochotona curzoniae), 1 792 Qinghai voles (Lasiopodomys fuscus)and 30 Tibetan hamsters (Cricetulus kamensis) among all the captured small mammals. The density of plateau pika population and its prevalence of echinococcosis were significantly higher than those of Qinghai voles (t=2.920, P=0.004; χ2=25.652, P=0.000). The density of small mammals (213.28/hm2)in summer pastures was significantly higher than that in winter pastures (158.77/hm) (t=4.340, P=0.000), and the infection rate in Qinghai voles in winter pastures (4.69%)was significantly higher than that in summer pastures (2.62%) (χ2=4.061, P=0.044). Following different months (April, June, August, October), the infection rates in plateau pika and Qinghai voles were rapidly increased (χtrend2=12.109, P=0.000; χtrend2=3.415, P=0.038). Conclusion The small mammals with echinococcosis in Shiqu county are mainly plateau pika and Qinghai vole. And they are widely distributed with heavy density and high prevalence of echinococcosis. Effective control measures should be implemented to reduce the risk of transmission of alveolar echinococcosis. 肖宁, 邱加闽, NakaoM, 等. 青藏高原东部地区发现的新种:石渠棘球绦虫的生物学特征[J]. 中国寄生虫学与寄生虫病杂志, 2008, 26(4): 307-312. 刘辉, 肖宁, 杨诗杰, 等. 青藏高原地区犬棘球绦虫感染的流行病学特征[J]. 中国血吸虫病防治杂志, 2017, 29(2): 129-138. 黄燕, 齐颜凤, 秦圣超, 等. 四川省棘球蚴病患病情况调查及评估[J]. 预防医学情报杂志, 2012, 28(8): 594-597. 许光荣, 张丽杰, 曾光. 2006-2011年四川省甘孜州棘球蚴病疫情分析[J]. 中国寄生虫学与寄生虫病杂志, 2013, 31(3): 224-228. 李富忠, 汪立茂, 李光清, 等. 青海田鼠活动规律的调查[J]. 现代预防医学, 2001, 28(4): 429-430. 刘振才, 汪立茂, 李光清, 等. 青海田鼠鼠疫自然疫源地监测指标及方法的研究[J]. 中国媒介生物学及控制杂志, 2002, 13(2): 95-97. 张守栋, 杨传华, 林恭华, 等. 高寒草甸3种啮齿动物内脏器官及相关性比较[J]. 四川动物, 2015, 34(3): 424-428. 张堰铭, 张知彬, 魏万红, 等. 高原鼠兔领域行为时间分配格局及其对风险环境适应的探讨[J]. 兽类学报, 2005, 25(4): 333-338. 张静宵, 王虎. 青海省动物棘球蚴病及棘球绦虫感染的流行病学调查[J]. 中国寄生虫学与寄生虫病杂志, 2007, 25(4): 350-352. 何金戈, 邱加闽, 刘凤洁, 等. 四川西部藏区包虫病流行病学研究Ⅱ.牲畜及野生动物两型包虫病感染状况调查[J]. 中国人兽共患病杂志, 2000, 16(5): 62-65. 祁腾, 杨孔, 汪立茂, 等. 石渠县2001-2013年鼠疫疫源地流行病学分析[J]. 中国人兽共患病学报, 2015, 31(5): 485-488. 刀吉, 刘继蓉, 鲁明德, 等. 1962-2012年四川省甘孜藏族自治州棘球蚴病流行病学分析[J]. 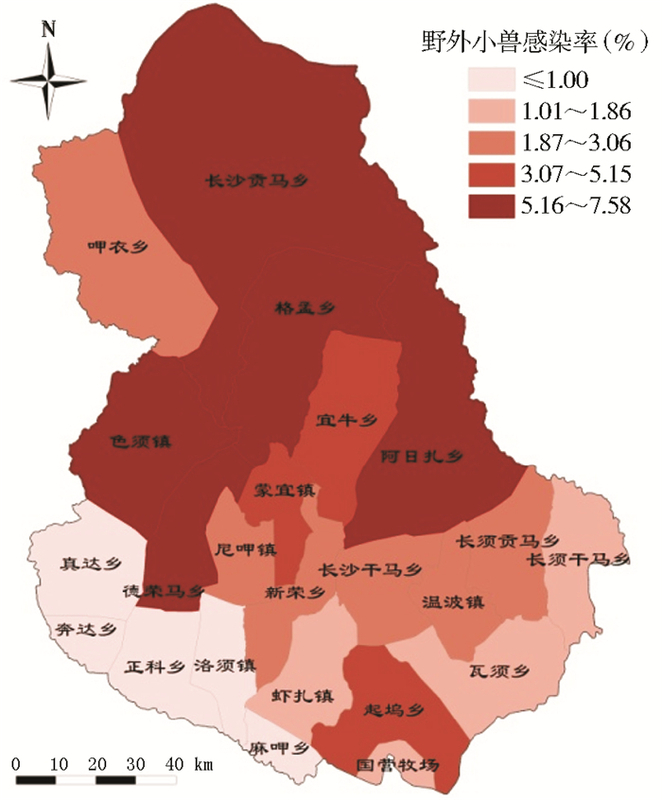 寄生虫病与感染性疾病, 2015, 13(2): 73-80. 四川省卫生厅. 四川省防治包虫病行动计划(2010-2015)[Z]. 成都: 四川省卫生厅, 2011. 李伟, 徐克均, 许光荣, 等. 甘孜藏族自治州棘球蚴病的流行和防控现状[J]. 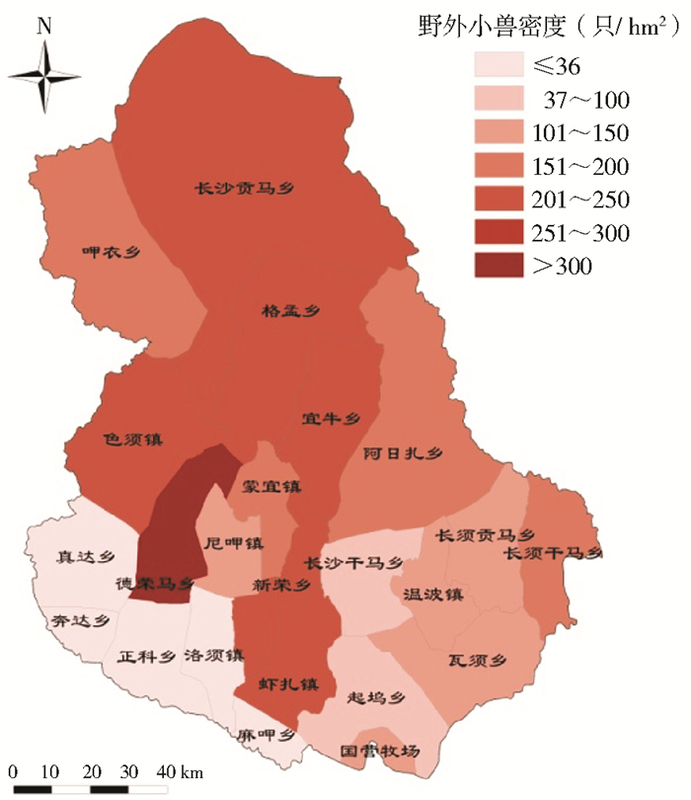 国际医学寄生虫病杂志, 2011, 38(5): 315-317. 中共四川省委, 四川省政府. 四川省甘孜州石渠县包虫病综合防治试点工作方案(2016-2020年)[Z]. 成都: 中共四川省委, 四川省人民政府, 2015.